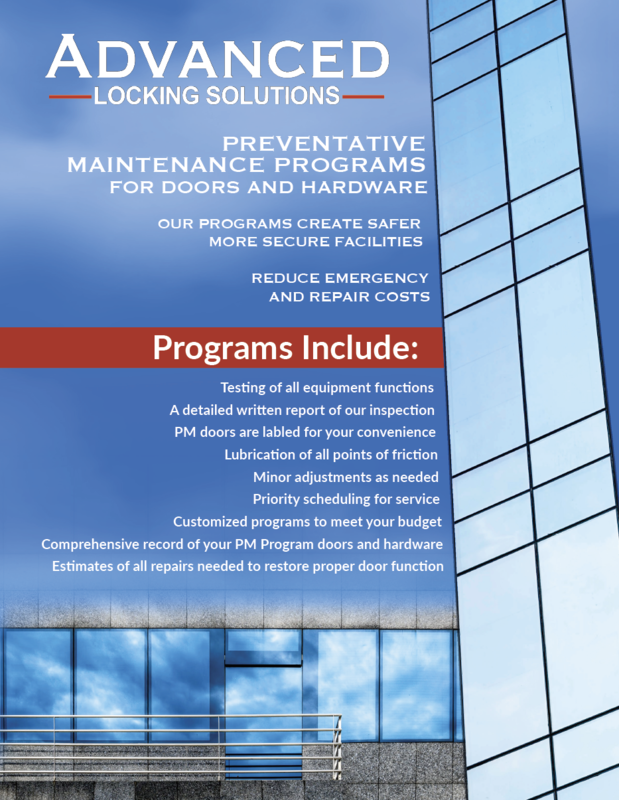 Offers a comprehensive operational review your doors and hardware to ensure proper functionality. Our skilled professionals examine and compile a report of your doors and hardware. They maintain and enhance equipment functionality by adjusting and lubricating parts as necessary. They tighten loose fasteners, and report any items that are excessively worn or cannot be modified to meet industry standards. Discover potential issues and plan service at your convenience as opposed to inconvenient emergency repairs. Ensure all openings meet applicable safety and ADA standards. Anticipating future costs of major upgrades and repairs, proactively will ensure that your facility’s safety and security is maintained. Significant decrease in costly downtime by extending the life of your doors, locks, and gates. Increase operational efficiency, reliability and safety of your facility’s doors and hardware, which reduces operational costs and repairs. Your facility’s doors are meeting the most current applicable standards. Subject SubjectPlease contact me.Interested in learning more.